Yipe! 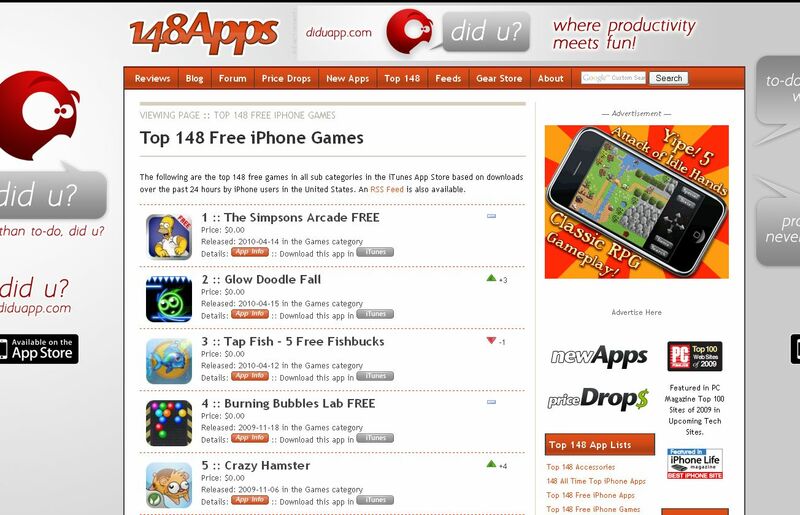 5 was released to the App store on December 5th, 2009. The free lite version went out March 10th, 2010. In the 4.5 months since that first version went out, I thought I’d share some stats on how things went with sales, downloads, updates, in-app purchases, etc. Ok, let’s break this down a bit. The game is typically priced at $1.99 in the app store. I’ve put it on sale for 99 cents a couple of times and sales definitely go up when that happens, more on that later. My “In App Purchases” are always 99 cents. They represent the in app purchases I have in the game for “Unlock additional Save Slots” and “Add 10 pack of heals”. The “In-App Unlock Game” row for the LITE version has been a $1.99 purchase up to this point and that unlocks the entire game, just as if you had bought the full version. Of those purchase prices, I receive 70% and Apple takes the other 30%. The numbers in the charts above represent my share, after Apple has already taken their cut. Notice the Apple Payouts section. Apple pays out on a monthly basis if you have received $150 USD value for any given currency. So far, I have only reached this twice, Dec 2009 for USD sales and Jan 2010 for USD sales. For AUD, GBP, EUR, CAN, JPY, I have not been paid anything from Apple for my sales since I have not yet reached $150 in total approximate sales. I went over $150 for March USD, but have not actually received the payout from Apple yet. It looks like I actually am there for EUR now. $161.92 total over 4.5 months. So, hopefully as April comes to a close, I should receive a payout for those sales. I have heard on discussion boards that Apple will eventually pay you out, even if you do not receive $150 in total sales for a given currency. I’m just not sure when this happens. Price changes and Updates. What increase do I receive? Here’s a weekly progress report with info on what (if anything) happened each week. Weeks are based on Apple’s weekly reports and cover the period of Monday through Sunday each week. These sales totals are specific to the full version and do not count in-app purchases or downloads of lite version. Week 1: 98 total sales (Dec 5, 6) First 2 days of being in the app store. Ahhh, these were the glory days. Made it up to top 55 in RPG category. Week 3: 160 (Dec 14-20) Version 1.1 was released on Dec 16th. This got TouchArcade.com members talking again and that definitely helped sales. The day before, Dec 15th, I actually cracked the top 100 again as 26 sales put me at 87th in top 100 RPG category. One thing the update did was allow 3.0 OS users to download the game. The original release only allowed 3.1 or higher OS iPhones to download the game. This however was not a major factor in increasing sales. From my stats on PinchMedia.com, about 2% of my downloads over all time have been from iPhone users with an OS Version below 3.1. Week 4: 150 (Dec 21-27) On Dec 23rd, SlideToPlay.com did a review of the game. Sadly it received only 2/4 stars, but the review was actually fairly positive. Week 6: 137 (Jan 4-10) 148Apps review of Yipe went out. 4/5 stars. Week 9: 39 (Jan 25-31) On Jan 29th, 1.2 version was released which had lots of major changes. I posted about those here: 1.2 Yipe changes. Week 10: 148 (Feb 1-7) On Feb 2nd, price was reduced to $0.99. Week 11: 27 (Feb 8-14) Raised price back up to $1.99 on Feb 8th. Week 14: 21 (Mar 1-7) Review of Yipe on TouchMyApps was on March 2nd. Week 15: 48 (Mar 8-14) March 10th, lite version was released. Week 16: 37 (Mar 15-21) March 12th was official release party in SF. March 16th, good review from SarcasticGamer.com. 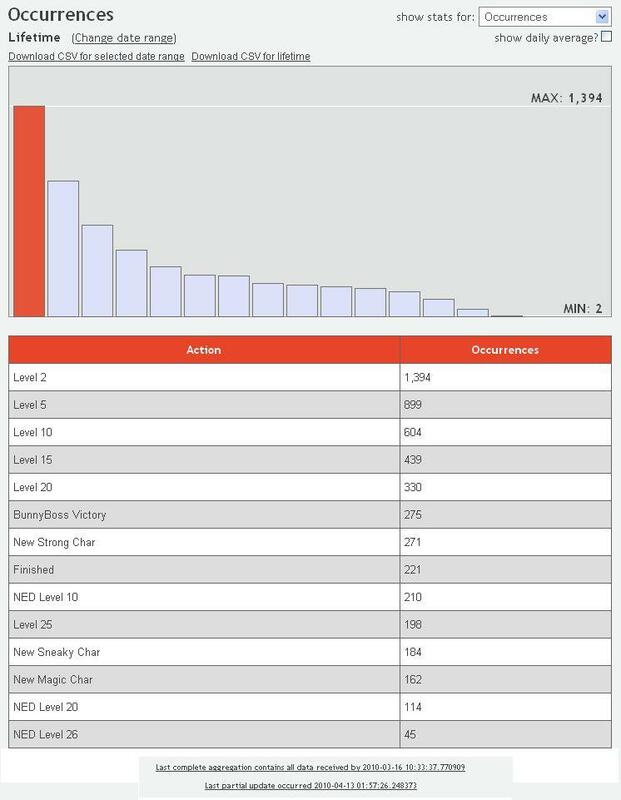 For the stats period ending March 21st, the lite version had a total of 919 installs and 39 of those purchased the in-app purchase to unlock the full game. March 21st, I started an ad on 148apps.com. The ad will run for 30 days. Week 17: 73 (Mar 22-28) On March 26th, price was reduced to $0.99. Week 18: 56 (Mar 29 – Apr 4) On April 2nd, price was raised back up to $1.99. Week 21: ?? (Apr 19-18) Just putting this uncompleted week here to note that my ad on BuySellAds.com expires on the 19th. The ad was displaying on 148apps.com. Results are in for the 30 day ad run: 42,796 impressions, 100 clicks, 0.23% click through rate, $0.02 ECPM. The ad directed people to the Yipe! 5 site, http://www.yipe5.com. Here’s a link to the Yipe! ad displaying on the site. Here’s the actual full animated Yipe! ad. Lastly, I will leave you with some links to my analytical data on PinchMedia. Pic 1: Dashboard. 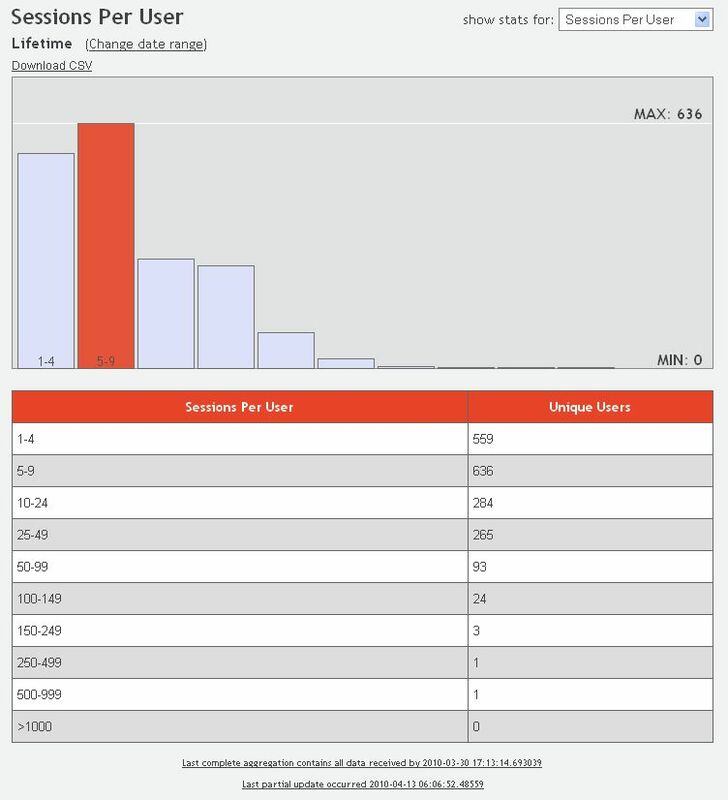 Shows total unique users according to PinchMedia. The Jailbroken users could be either paying or cracked version users. No way to tell. Pic 2: More Dashboard info. 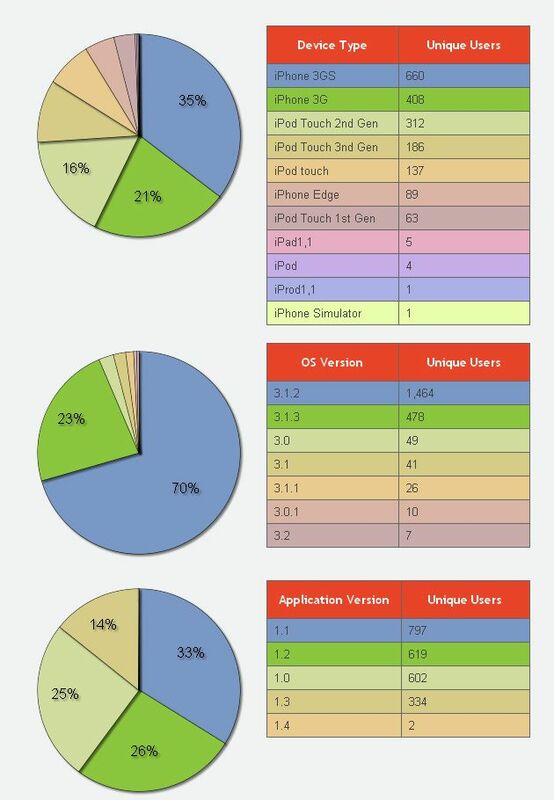 Breaks down the Device type, OS Version and Application version. Pic 3: Number of sessions per unique user over the lifetime of Yipe! 5 (full version). Most people only open up the game 5-9 times, but there are still plenty of people who have opened the game up even more. I wonder who the 500+ user is? Pic 4: Session Durations. Every time someone opens the game, how long do they keep it open, before closing the application? I like this chart a lot because it shows that Yipe users typically stay within the application a fairly long time. 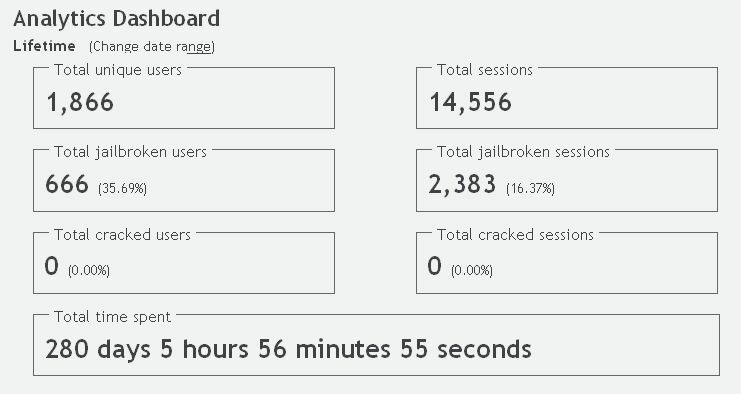 Most users keep the app open from 2-10 minutes and a significant amount of sessions last over 10 minutes. Pic 5: Using PinchMedia, I can track specific occurrences in the game. I set the game up to let me know when users hit certain levels, beat the first boss monster, finish the game and start new characters of a specific type. Keep in mind that a single user could have started more than 1 character, so these are not unique user numbers. 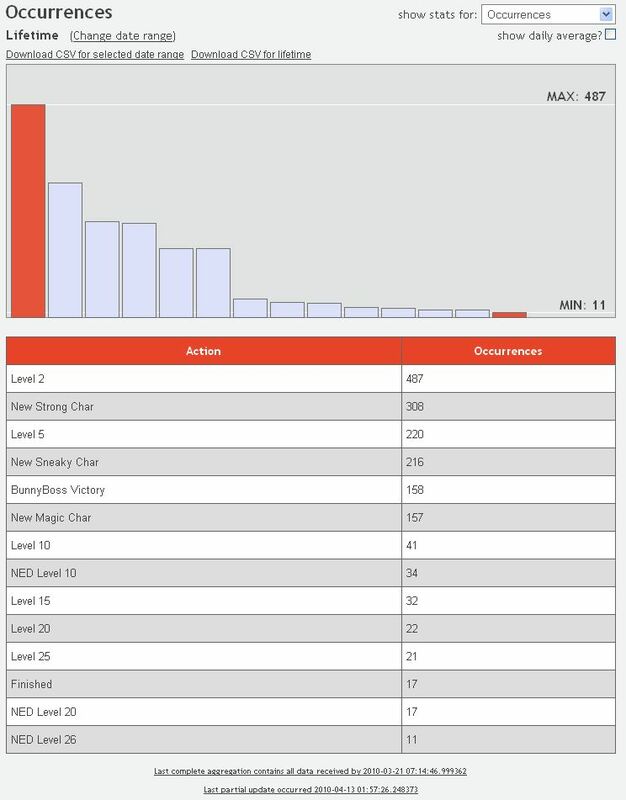 I also didn’t add the tracking for new chars, bunny boss or NED levels until version 1.2, which explains why the numbers are so off for level 2, 5, 10, 15, 20, which were all in place from day 1, as was “Finished”. Pic 6: As I looked at Pic 5, I realized the lifetime data here isn’t as meaningful, since I didn’t record everything from day 1. For the lite version I did record everything from day 1, so here are the stats for the lite version. Keep in mind that a player can only reach level 8 in the “trial” part of the lite version. You must use the “unlock game” in-app purchase to advance past level 8, get to the NED cave, finish the game, etc. Total unique users who have unlocked the full lite version: 76. Well, that’s my 4.5 month report! This entry was posted on April 19, 2010 at 8:35 pm and is filed under Sales Report, Yipe 5. You can follow any responses to this entry through the RSS 2.0 feed. You can leave a response, or trackback from your own site. 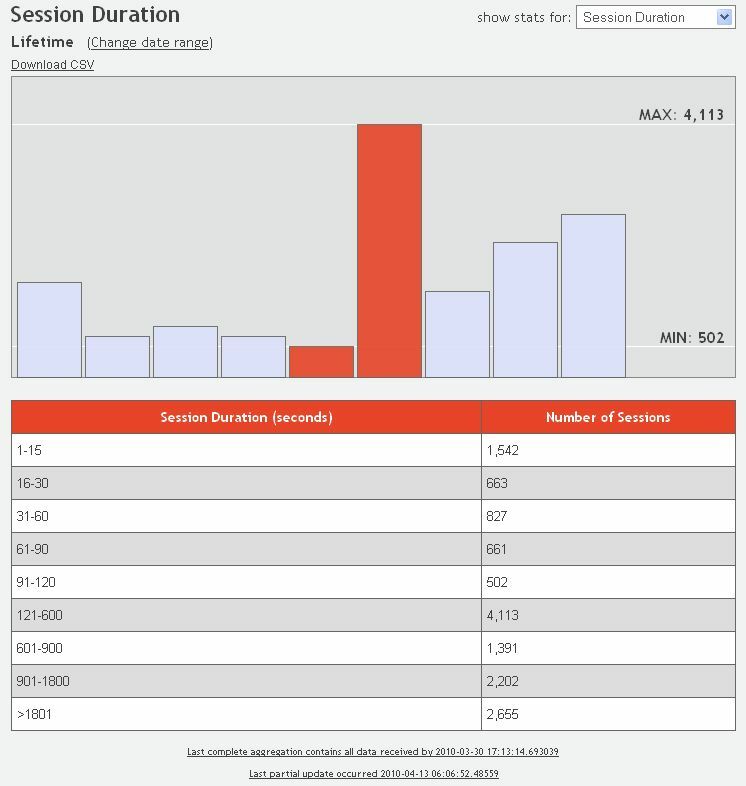 I’m probably one of the users in the long tail of unique sessions (pic #3)… maybe not 500, but at least >100. I’ll tell ya, it’s hard to play an RPG when your toddler keeps grabbing your ipod! Cool! I’d like to know how well the classic Yipe! games did on the old mac’s! That was a really nice article! like these are really inspiring, thanks! happy to find Yipe 5 in the AppStore. Awesome game! Hey, long time fan (from the Yipe 2/3 days), first time poster here. As for the stats, I’d probably be in the 100 or even 200+ range for unique sessions, but that’s probably because 3 different people use the 3 files. Imo you should decrease the price of Yipe III. For 5 bucks you can get better games off steam. I’d buy it if it were cheaper.